Lin Ostrom will have a lasting effect, not only on those who were privileged to know her. The following comments from friends and colleagues in the RA community have several common themes and one doesn’t have to read far to gain a sense of her legacy. More reflections will be added here in the coming days. I hope reading them brings a small measure of comfort. Lin showed us how someone with extraordinary intellectual power and the highest international recognition can also be a kind, friendly, and supportive human to all. Thank you, Lin, for teaching us so much, in so many ways. The words that I have most frequently heard when someone describes Lin: energetic, enthusiastic, tireless, and insightful. We can clearly add many more – kind, caring, collaborative, and so on. I’d like to focus on something else, something that always brings a smile to my face. In discussions with many others, I’ve heard mention of this, but I’ve never seen it written…it’s the Sounds of Lin. She chuckled, chortled, cackled, laughed with great mirth, and commented enthusiastically. Her discussions of lab experiments and “cheap talk” often came with a rejoinder about “scumbuckets”. Her frustrated sighs during presentations gave pause to many orators. Her “oohs and aahs” in the middle of formal presentations – both her own and others – always brought a smile to my face. She added more lively sound effects – whams, pows, umphs – than anyone that I know, and her grad students and colleagues just ate it up. One of my fondest memories was going to a hotel gym to get a short run in before a conference. The TV was blaring sports highlights. A few minutes later Lin came in. She started exercising and watching the highlights too. Soon every dunk, goal, or home run was emphasized with a wham, pow, or umph from our little gym too. The memory still makes me smile. Lin’s departure is a great loss to everyone conducting trasnsdisciplinary environmental science, but hopefully we will be able to carry her ideas and determination forward. When I was preparing a speech in honour of Lin’s Nobel prize I spoke to many colleagues and one of the fundamental contributions of Lin’s work which emerged was that it created a platform for transdisciplinary academic research. Many ‘young’ academics said that coming into contact with Lin’s work early on in their careers was crucial for the development of their research. In many ways her work served to legitimize efforts of those seeking to address environmental issues in the field of political science. But it also inspired others, outside the political sciences. Furthermore, despite her many engagements and her high academic standing, Lin always has time to chat to students and offer friendly and sometimes critical but always constructive advise. She also served as a wonderful female role model for all of us (more or less) young women in academic settings. Another of Lin’s great contributions to research on natural resource management was her use of multiple methods. Although not the only one, she has been very prominent in employing and promoting a multi-method approach to understanding issues of resource management. This has open the eyes of many young scientists from across the natural and social sciences to the value of this approach – and it is one of the important contributions of Lin’s work to our group here at Stockholm Resilience Centre. It has also opened the eyes of many ecologists to the fact that social values, such as social relations and trust-building are in fact very important for understanding resource management outcomes. In summary – Lin has had a tremendous, and fundamental, impact on natural resource management research as we know it today. Among the many profound lessons that Lin taught by example was that humility is a basic ingredient in human cooperation. It is rare to find a person, whose achievements were as notable as Lin’s, as interested in others as Lin was. 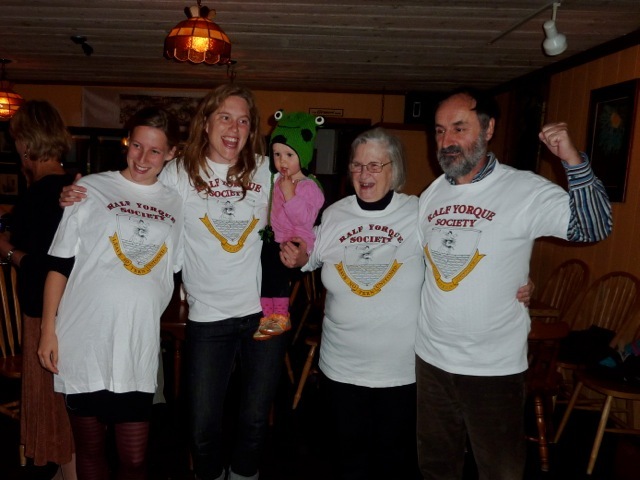 One of my fondest memories of Lin was at the Mock Court that the RAYS organized in Gabriola. She entered into the spirit of the event unreservedly, her eyes shining, her face alight, giving her all in a playful yet deeply serious manner. She always wanted to help and loved to watch young scholars developing their arguments and their expertise. I also remember several personal conversations with her; her life was not always an easy one, and yet she was so glad to be alive, so grateful for the opportunities that had come her way. How rare to find such a spirit of humility and glad grace in someone who had every right to be arrogant and proud! I will miss that enlightening mind and that joyous spirit, very much. We were all lucky to have her with us. Lin you are an extraordinary role model and forward thinking individual. You have inspired so many of us to take the bold step into interdisciplinary science. You have also shown us the importance of living life and loving what you do. Her scientific brilliance and analytical sharpness was combined with true curiosity and lack of prestige. In our interactions, she challenged me to think harder, i.e. to be more clear in defining my research questions and to better link theories, methods and data with these questions while simultaneously greatly inspired me to do so. In short, she helped me to be a better scientist, and I will always be grateful to her for that. Her passing is a great loss. Lin exemplified the very best in the fabulous effectiveness of brilliant curmudgeons in driving attention to the neglected. Elinor Ostrom’s work challenged a cultural myth that remains as one of our biggest challenges as a species to learning to live sustainably, and the influence of this contribution will continue to be revealed and realized for decades if not centuries. She is an icon. It is difficult for me to write a personal reflection about Lin Ostrom because I am so devastated by the news of her passing that it will take me a long time to recover. I can only speak of her in the present tense. Many others will speak to the brilliance of her scientific work and the profound impact it has had, and will continue to have, on so many branches of science. I want to speak to how Lin is the most amazing person I have ever met. For example Lin visited the University of Wisconsin arriving in the morning of October 5, 2011 and leaving at the ungodly hour of 5:45 am on October 7. The very intense schedule of activities would have completely exhausted any other scientist, but not Lin. I bet that even the bleary-eyed taxi driver who took her to the airport ended up wide awake and simply entranced at the end of the drive. I am sure that the large number of people who experienced her visit were thrilled to be a part of it. As another example, I was part of a group that worked on articles for a special feature collection for PNAS in 2007 that was organized by Lin. Working under her direction was one of the best experiences of my life. Her generosity to everyone that I’ve seen in my experiences with her is unmatched. I don’t know of any words that can describe how special she is. Elinor’s rare brand of kind compassion and scholarship endured until her last days. In her final commentary “Green from the Grassroots”, published on-line on 12 June 2012, she wrote: “sustainability at local and national levels must add up to global sustainability”and “time is the natural resource in shortest supply”. Her influence stretched far beyond her own country. Her work for example contributed the emergence of many of the community wildlife management programmes in Zimbabwe, Botswana, Namibia and South Africa, which catalyzed a number of innovative natural resource management policies throughout southern Africa. This ultimately changed the lives of tens of thousands of rural people and might one day become the basis for sustainable land reform in the region. As many others have noted, she was a wise and inspirational scholar and colleague, who brought forward and helped shape many important ideas. Personally, I always appreciated her unbounded enthusiasm and thoughtfulness not just for her work, but for life in general. What so many of us aspire to, Lin achieved: to make our home in the universe a better place. I am grateful for the transforming insights she developed and shared, the people she equipped to continue exploring the path she opened up, and the trust, inspiration and constructive questions she brought to every encounter with students and colleagues. Lin has left us, but her imprint will continue to grow. My most cherished memory is of breakfast with Lin at the Gabriola meeting. We sat with two RAYS – PhD students – and Lin listened intently and asked about their research. She was so genuinely interested and attentive to what they were doing. Her generosity of spirit and commitment to mentoring new researches was so evident. A towering intellect and a true inspiration, who really has changed how we think, I feel so privileged to have known her. We can thank Lin for investing so much thought, time and resources in building and guiding a large cohort of successors to continue her quest for understanding, using and protecting our precious commons. Even so we are bereaved by the loss of her intellect, imagination, drive and compassion. Lin Ostrom at Gabriola Island, 2009. Photo by Garry Peterson. We read Hardin’s “Tragedy of the Commons” during my undergraduate program in Environmental Studies and it shaped so many careers of fellow students. I am proud to be part of Lin’s legacy in expanding my own students’ frames of reference towards collaboration as a solution. My favorite moment with Lin was on Gabriola Island, where she eagerly took on the role of cross-examiner, slamming her arm down on her desk and taking those of us “on trial” to task for our use of loose definitions. What a brilliant way to learn, and what a wonderful and generous person she was. I remember at Gabriola Island not knowing who the speaker was, and listening rapt. On introduction Lin Ostrom was warm and delightful. What a privilege to have met and listened to her. I, too, have a vivid and intense memory of Lin on Gabriola Island where I met her for the first time. I was in awe of her towering intellect and impressed by her academic leadership. But Lin was also so surprisingly down-to-earth and invited me to join her for lunch. We sat merrily talking about how to make more nudges in the world, and if and how to really determine whether the fish we eat was sustainable or not. Such curiosity and generosity of spirit. A huge loss. June 2011, Montpellier, at the end of Elinor Ostrom’s conference. Last question – “Professor Ostrom, can your Nobel Prize make a difference for a better world?”. Lin Ostrom was a teacher, mentor, and scholar living all of this work and the people she touched in life lived well. Lin Ostrom loved music. One of my favorite memories of Lin occurred during my time as her (and soon Vincent’s) graduate student. Lin often had students come to their amazing home with its many artifacts, incredible art, and beautiful woods. On this occasion Vincent was out of town and Lin asked me to come to discuss a paper that I was writing. As I crested the hill that led to their home I thought I heard an orchestral concert. The music grew louder as I approached the house, nestled in an Indiana hollow, below–so loud that Lin couldn’t hear me knock. So, I went in and there was Lin, her back to me, hi fi maxed, conducting Tchaikovsky’s Fourth Symphony. And she was good! I was astonished! We didn’t talk about the paper. We talked about her mother, who had been symphony manager of the San Francisco Opera and her father, who had been a very well known set designer on Broadway. We talked about music through the rest of that visit and many times later. I never had the privelage of meeting her, but her books were amazing. The inspiration I felt when I read her books is undescrible. I feel like I know her, though I will never have the opportunity to actually meet her. Your writings will live on.. What a wonderful role model you will be for many, many people! and we all thank you!